This winter, summer becomes a destination when the Providence Boat Show draws exhibitors from throughout New England to re-create a Northeast boater’s favorite season inside the Rhode Island Convention Center in Providence, RI. The show will be held January 31 to February 2 and will feature boats, gear and equipment, seminars, and plenty of inspiration from experts. Now in its 21st year, the Providence Boat Show was purchased by the Rhode Island Marine Trades Association (RIMTA) last fall, and organizers have revitalized the show with new features, a stronger sailing component, and a mix of events and exhibitors that reflects the boating diversity found inside the Ocean State and its marine industry. New this year is a special H20 Zone that will showcase a fleet of small watercraft for all levels, along with experts and accompanying video. A joint effort of Zim Sailing in Warren and community sailing organizations Sail Newport and the Community Boating Center of Providence, this zone is the main hub for learning about the different ways you can get out on the water in whatever way suits your skill level or style. The fleet will range from the simple, unsinkable Blue Dragon Pram to the high-performance, otherworldly Moth, the diminutive single-handed hydrofoil considered by many to be the fastest dinghy on the planet. A new show pavilion will crown the event with special attractions, such as a rare opportunity to discover how the Ocean State’s leading chefs cook their catch, including Executive Chef John Kolesar from the venerable Ocean House resort in Watch Hill and Phyllis Affra of Blaze Restaurant in Providence; a chance to learn about the making of Rhode Island’s Tall Ship Oliver Hazard Perry; and other events. On opening day, attendees will have a chance to meet America’s Cup sailor Rome Kirby of the winning Oracle Team USA crew. This year’s show includes two seminar series. Captain John Martino, founder of the Annapolis School of Seamanship, has coordinated navigation and seamanship seminars in conjunction with Rhode Island outfits Confident Captain, Safe/Sea, and Captain Frank “Skip” Litterer of Boatwise Marine Training. Attend a session on iNavigation and learn how to mix traditional navigation skills with the latest apps for tablets and phones, or try your hand at a VSTEP bridge simulator. This type of simulator, used by merchant marine schools, is a great way to get introduced to piloting skills, giving you a feel for navigating a computer-driven boat in the safety of a landlocked convention hall before you take out the real thing. In another session, Captain Skip Litterer, a local mariner with a wealth of knowledge, will help showgoers plan their next cruise along the Rhode Island coast. 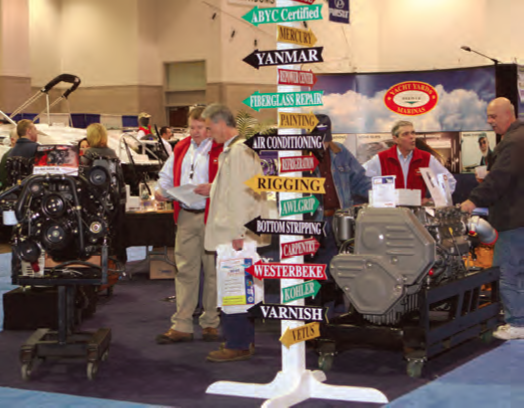 The Providence Boat Show is designed to be an event where boaters can broaden their horizons. Inshore racers lured by the mystique of round-the-world racing can learn about next year’s Volvo Ocean Race stopover in Newport and even sign up to become involved as a volunteer. Sailors intrigued by surfing can take a spin on a SURFSET board, a total-body surf trainer designed to simulate the physical demands of surfing without the ocean. And boaters who are considering Rhode Island as their new boating home can do their homework on marinas and winter storage options; the Ocean State has a no-sales-tax policy on boats that are delivered and registered in the state, as well as on boating services such as mooring and slip fees, winter storage, and refit and repair work. To get the latest on the Providence Boat Show, connect with the show on Facebook or visit providenceboatshow.com.